Finding a licensed Architect to design in the mountains can be a challenge. You have come to the right place. This company designs houses in scenic locations throughout the USA and the world, many of them mountainous, with steep terrain. Mountain home architects are licensed professionals, trained at major universities and licensed by various states. Mountain HOME ARCHITECTS ® project under construction in the Blue Ridge Mountains of North Carolina . This project has now been completed. Mountain Home Retreat series designed by senior staff architect, Rand Soellner,ArCH/NCARB/LHI. (C)Copyright 2009-2012 Home Architect, PLLC, All Rights Reserved Worldwide. The HOME ARCHITECTS ® company qualifies as custom residential architects and mountain home architects. The firm has a great deal of experience with designing houses and buildings on flat ground in places like Orlando, Florida as well as designing mountain homes in steep topography in locations like Cashiers, North Carolina, Highlands, Brevard, Asheville, Tennessee, Virginia, West Virginia, Illinios, Washington State, and other scenic locations. 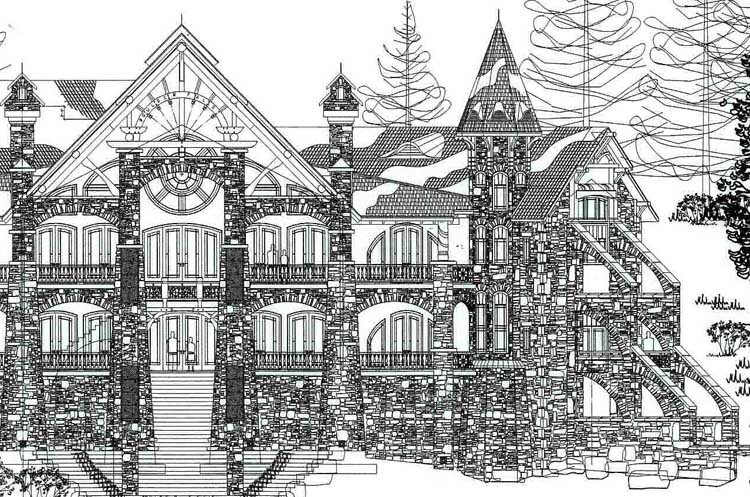 Mountain HOME ARCHITECTS ® partial elevation of one of their mountain castle designs. Senior staff member, Rand Soellner, ArCH, traveled to Chartres Cathedral in the countryside outside of Paris for the rose window, and studied Notre Dame’s flying buttresses on the island of Cite in the middle of the Seine in downtown Paris for the right side buttresses. (C)Copyright 2005-2012 Home Architect, PLLC, All Rights Reserved Worldwide. 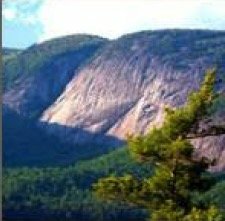 Mountain home architects combine your lifestyle with your magnificent mountain land & views, seamlessly blending that steep topography into floor plans and elevations and building spaces that are breathtaking. Mountain HOME ARCHITECTS ® can help you find your dream house builder and coordinate with them to help you see your visions become reality. Senior staff member, Rand Soellner’s iconic Falcon Cliff Lodge, his family’s own residence in Cashiers, NC. 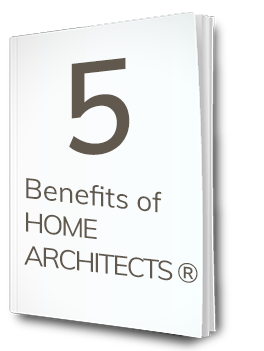 Mountain home architects = HOME ARCHITECTS ®. (C)Copyright 2005-2012 Home Architect, PLLC, All Rights Reserved Worldwide. 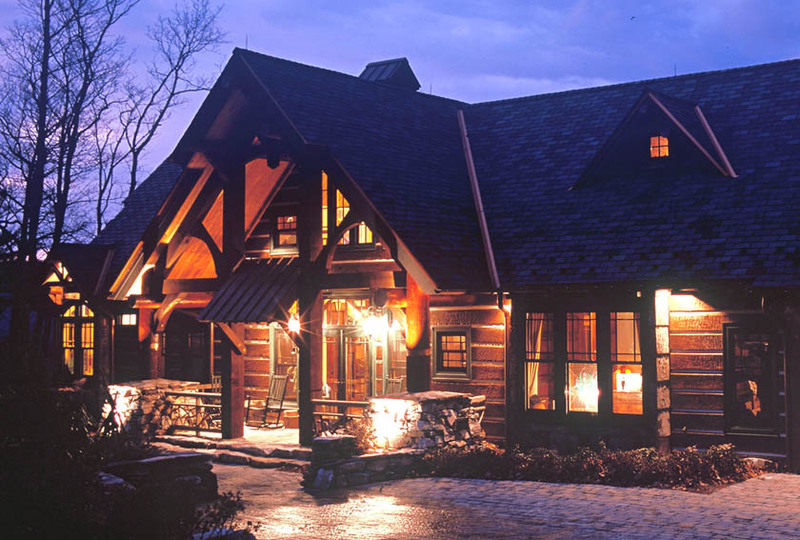 This company = mountain HOME ARCHITECTS ®. Project designs by company staff members have been featured in books and magazines across the USA and the world. Please review this website and if you like, give us a call; come visit and we’ll give you a cup of coffee, answer your questions, show you some drawings and give you a couple of tours of our built projects. In the process, you’ll get to enjoy the mountains around here. We’ll bet that by then that you will see what many others have: that the company = mountain HOME ARCHITECTS ®. Special skills of mountain home architects. There are special skills you have to have when you are mountain home architects. 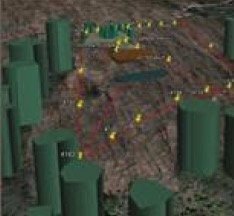 You have to understand the geology of mountain terrain and know how foundations connect to bedrock and how that is economically accomplished. You have to understand the flow of rainwater above and below ground and how this must be diverted around and under your structure to have a clean, dry house. How about your VIEWS? 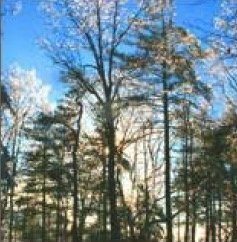 That word is capitalized because usually, the Big Views are the reason that you purchased your mountain house site. 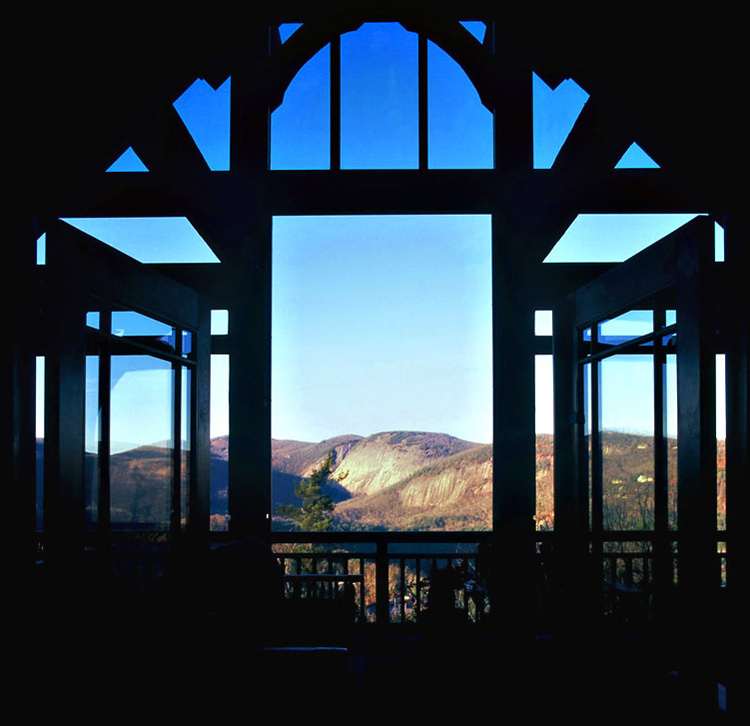 You have the unspoken requirement that these amazing views will be framed with large glass areas and that your mountain home architects will do this as a matter of course. The people in this company do. Not everyone else does. The firm considers this a sacred obligation: what nature put there, you deserve to see. Mountain home architects at this company do this naturally, weaving your pedestrian paths through your house, focusing your paths of travel to orient toward those big views. Seating areas oriented to the views, kitchen counters oriented toward the views, dining areas oriented to the views. Half of a mountain house is about the views. This takes skill and passion. Mountain home architects and your site and lifestyle. Mountain HOME ARCHITECTS ® devote considerable attention to your site and to your lifestyle. These are perhaps the two most important aspects of senior staff member Rand Soellner’s focus. Your lifestyle is really an expression of how you want to live and where you want things to be located. Your mountain site has various characteristics like steepness, orientation to views, street, neighbors, wind, sun, vehicular circulation space and the like. Mountain home architects must weave these two main considerations together to result in a seamless result: your mountain house design, affording you the wonderful views of your acreage that you knew were possible, and giving you the functionality of which you have always dreamed. 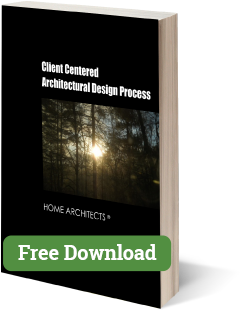 You are encouraged to review this website of one of the leading mountain home architects in the world and see if you can find enough compatible photos, renderings and discussions that might convince you to give the company a call, online chat or e-mail to see if perhaps you might want them to design something for you. Mountain home architects love the mountains. Mountain HOME ARCHITECTS ® have expressed a love for the steep and beautiful terrains referred to as mountains. If you have this passion for the rugged beauty of the these spectacular environments, then that is half the mission. In this website, you will find an assortment of residential designs, some referred to as: the work of mountain home architects, mountain house retreats, mountain lodges, custom residential designs, family estate designs, log house designs, mountain castle designs and mountain resort projects. There is a lot about the mountains, isn’t there? And yet, senior staff architect Soellner tries to point out that he also designs residences for flat land in suburban locations like Atlanta, Orlando, Charlotte and other “typical project” locations. Some have said that if you can designs for the mountains, then you can certainly handle simpler situations in conventional suburbia, and that is true. The mountain HOME ARCHITECTS ®. Senior staff architect Soellner has been designing residences for a long time, over 4 decades and never tires of endeavoring to improve on his craft. His latest mountain house plans he has entitled his Mountain Home Retreat Series. These have a tremendous sophistication of design elegance beneath their rustic exteriors. Their very proportions are oriented to take advantage of mountainous topography: they are wide from left to right and more shallow, from front to rear, even though the are spacious and exhibit the best of open plan home design. They have steeply sloping roofs to shed snow and ice and for appearance and spacial volume. Materials, like granite boulders and rockwork, grace his foundation walls frequently, a touch that he calls: “Growing out of the mountain.” He uses a variety of siding materials to suit his clients’ tastes, including cedar shingles, poplar bark shingles, slate-look roof tiles and large windows. He has actually invented a huge sliding glass door arrangement for the typical big rear views he calls his: “Grand Canyon Dor”. This is 12′ tall x 22′ wide and pockets to each side. Additional features in many of the company’s designs include substantial kitchen dimensions, with huge center islands, around which your entire family can congregate. This heart of the house is crucial to your house; the firm understands that. Also, lots of counter space and hardwood cabinetry is important to you. And what about the grand centerpiece of your gas cooktop burners where you do much of the cooking? The company creates this as a focal point, flanked by counters, and vaulted over with a rock arch, if you so choose, along with stone wall posts. You can’t get much more visceral and rustically elegant than this. All of these are of course ideas that you may wish to modify. Outdoor Living Rooms are standard in most of the firm’s residential designs, especially in the mountains. Why? Because the mountain views are typically so spectacular! Who doesn’t want to be able to walk out from their kitchen or great room or master bedroom onto a covered porch and sit down by an outdoor fireplace and enjoy the layered views? It lifts our hearts and spirits. This is the essence of living in this topography. The dimensions of this outdoor living space are critical. You want to be able to have a seating grouping in which everyone is comfortable and can all enjoy the views and fireplace and fellowship. Master suites in the company’s mountain residences are beyond compare. They feature elements like 2-way fireplaces between the bedroom and an elegant optional whirlpool tub, 2-person large showers with slate tiles, separated toilet and optional bidet rooms, separate His and Her vanities with their own sink. A Hers Grooming sit down area in the Master Bath with an option for another in the Master Dressing Room. Heated slate tile floor in the Master Bathroom. Lots of windows and lots of light. Built in lighting and heat lights. Access from the Master Bathroom into Both the Master Bedroom and the Master Dressing Room (have you ever seen this anywhere else in your life?) These are luxuries and conveniences that the firm has labored over passionately, to give you, the owner the best house we can possible create for you. 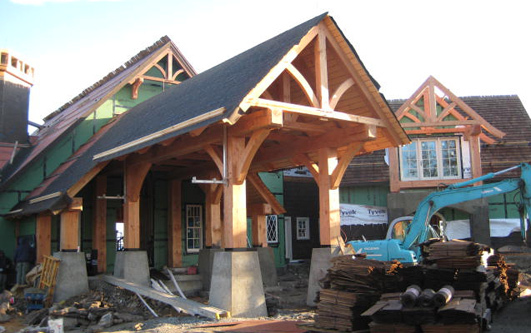 We are seeking timber frame and post and beam fabrication companies whom we can suggest to our clients throughout the USA and the world. We prefer companies that have an ISO9000 Quality Control plan in effect, in written form that can be e-mailed to us. 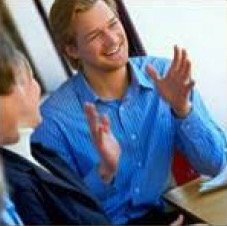 We would like to see recommendations from at least 3 satisfied clients of yours in the region that you would like to represent. We see this taking shape with each timber fabrication company representing a multi-state geographic area, probably 2 to 5 states closest to your fabrication facilities to control shipping costs and usage of gasoline and other petrochemical products in shipping procedures. We will create a webpage on this website for each of those qualifying interested companies. Our desire is to end up with a network of timber fabricators upon whom we can reference to mutual clients. We will also request that you provide a webpage on your website for us, with several links with certain anchor text, if you are interested. We look forward to your participation in establishing this one of a kind network which should serve to direct our mutual clients to each other for high quality goods and services.